AFTER finishing the inaugural 2017 AFLW season in third, Melbourne entered the NAB AFLW Draft of October 2017 with four picks inside the top 30. The off-season had already seen Bianca Jakobsson (Carlton) and Ash Guest (GWS Giants) traded in, with four rookies – Anna Teague, Maddie Shevlin, Kate Hore and Erin Hoare –also signed. 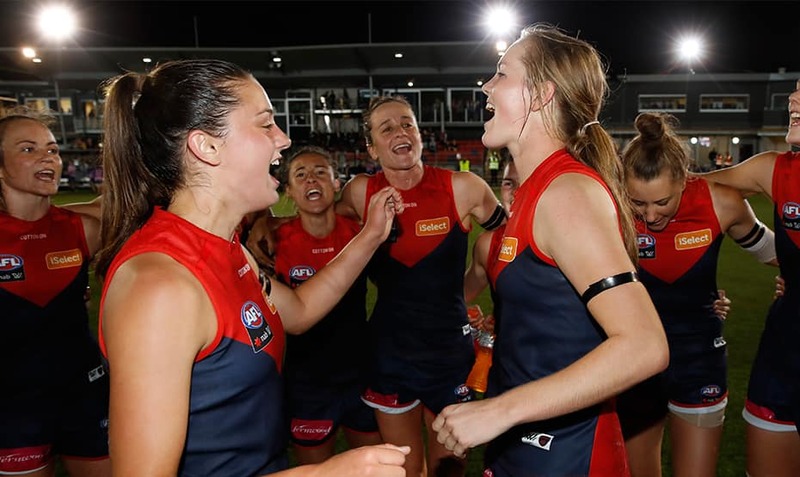 Melbourne would go on on to draft two tall forwards, Eden Zanker and Tegan Cunningham, along with two athletic midfielders in Maddy Guerin and Claudia Whitfort. 12 months on, we look back at the draft and how the four red and blue recruits have fared since. The Bendigo Pioneers key forward was Melbourne’s first selection at the AFLW draft. Zanker was recruited after displaying brilliant form in the 2017 U18 Championships for Vic Country. The 18-year-old was the tournament’s leading goalkicker and was named at centre half-forward in the U18 All-Australian team following the Championships. Zanker made her AFLW debut in the round five win against the Brisbane Lions at Casey Fields, playing the remaining three matches for the season. She went on to star for Casey in the 2018 VFLW season, kicking nine goals and winning the club’s Best and Fairest award. Recruited from the Northern Knights, midfielder Maddy Guerin was Melbourne’s second selection at the draft at pick number 14. Upon her recruitment in October 2017, AFLW list manager Todd Patterson highlighted her athletic prowess and kicking efficiency as her strengths. Guerin pulled on the Melbourne guernsey once in 2018, debuting in the round one clash with the GWS Giants at Casey Fields. The 18-year-old played for the Darebin Falcons in the 2018 VFLW season. An experienced basketballer in the WNBL and US college system, Cunningham worked out to be an excellent addition to Melbourne’s squad. Having played little footy heading into the season, the 30-year-old spearheaded Melbourne’s forward line in 2018 and led the club’s goalkicking with nine majors. She played all seven matches in the 2018 AFLW season. Whitfort was Melbourne’s final selection of the draft and learnt the news while watching the draft on an iPad as she completed year 12. Whitfort came from a mixed sport background, with history in athletics, netball and lifesaving, with her athletic abilities sparking interest from recruiters. The 19-year-old debuted alongside Eden Zanker in the round five match against Brisbane at Casey Fields and played Melbourne’s three final games of 2018. Whitfort also played three matches for the Casey Demons in the 2018 VFLW season.